A PASGT vest and helmet in woodland camouflage. Made by numerous manufacturers, such as Isratex, Inc. Personnel Armor System for Ground Troops (PASGT, pronounced /ˈpæzɡət/ PAZ-gət) is a combat helmet and ballistic vest that was used by the United States military from the early 1980s until the mid-2000s, when the helmet and vest were succeeded by the Lightweight Helmet (LWH), Modular Integrated Communications Helmet (MICH), and Interceptor Body Armor (IBA) respectively. Designed in the mid-1970s as a replacement for the M1 helmet and previous fragmentation vests, prototypes of the PASGT were tested in the late 1970s before being fielded in the early 1980s. 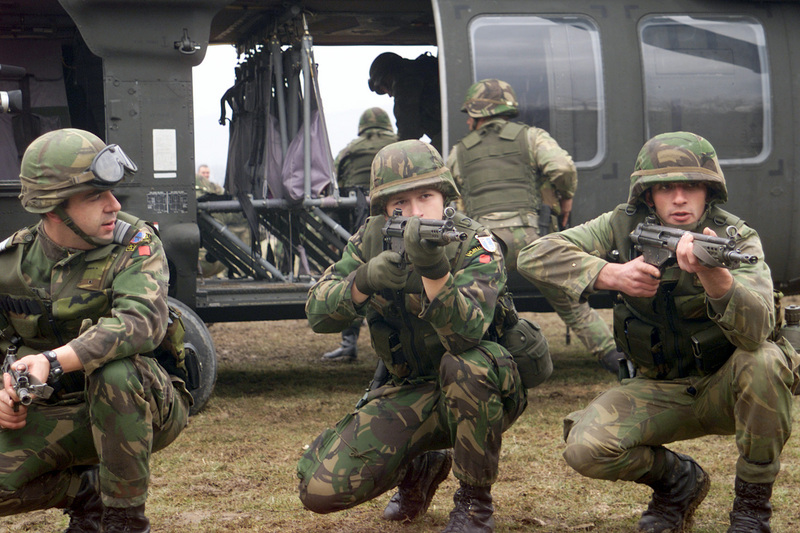 In the early 2000s, the PASGT vest began being replaced by the IBA and the PASGT helmet was replaced soon thereafter with the LWH and MICH. As of 2018, the only remaining U.S. military users of PASGT in any capacity are the U.S. Army Reserve and the U.S. Navy, the latter of which retains the PASGT helmet for use by sailors aboard its warships, in addition to a PASGT-derived vest known as the "U.S. Navy Flak Jacket". PASGT is an acronym, standing for Personnel Armor System for Ground Troops. When used by itself, PASGT refers to both the vest and helmet together. In the U.S. military, the PASGT helmet was most commonly known by its wearers as simply the "Kevlar". The nickname has since been adopted for usage with other helmets. The PASGT helmet was also referred to by its wearers in the U.S. military as the "K-pot", similar in name to the colloquial nickname "steel pot" for the steel M1 helmet, which was in widespread U.S. military usage from the 1940s, to the 1970s, including the Vietnam War. The PASGT helmet was also, but less commonly, known by its wearers as the "Fritz" helmet for its resemblance to the Stahlhelm, which was the standard helmet used by the German military forces in the First and Second World Wars. On the other hand, the PASGT vest was colloquially known as the "flak vest" by its wearers in the U.S. military. A man in 1975 modelling an early prototype variant of the PASGT helmet and vest in the ERDL pattern. U.S. soldiers riding in a jeep in 1977, while wearing prototypes of the PASGT vest and helmet. PASGT vests and helmets being used by U.S. servicemen during the invasion of Grenada in October 1983, the first combat usage of the PASGT system. A U.S. airman in September 2001 wearing a PASGT helmet and vest with desert camouflage covers. A U.S. Navy Seabee in May 2003 wearing a PASGT vest and helmet. In December 2003, U.S. Army soldiers from the 173rd Airborne Brigade, 4th Infantry Division, wear their PASGT helmets as they pull security on the streets of Al Hawijah, Iraq. A U.S. Marine in 2007 wearing a PASGT helmet; the USMC has since replaced the PASGT helmet with the LWH helmet. The Personnel Armor System for Ground Troops Helmet is a combat helmet first employed by the U.S. military in 1983 and eventually adopted by many other military and law enforcement agencies internationally. The shell is made from 19 layers of Kevlar, a ballistic aramid fabric treated with a phenolic resin system and is rated at a Threat Level IIIA as per DARPA, USMC, and U.S. Army and offers protection against shrapnel and ballistic threats. It meets the 1800 requirement of MIL-STD-662 E. It weighs from 3.1 lb (1,410 g) (size extra small) to 4.2 lb (1,910 g) (extra large). U.S. Navy sailors in January 2017 wearing the PASGT helmet. The PASGT helmet is typically olive drab in color and can be fitted with cloth helmet covers to increase camouflaging capabilities, which come in a wide array of varying camouflage patterns, including, but not limited to, Woodland, six-color desert, three-color desert, and winter/snow white, solid black, for tactical police applications, as well as the U.S. Marine Corps's MARPAT and the U.S. Army's Universal Camouflage Pattern. The PASGT helmet is also used by various SWAT teams, where it is often black, with or without covering. It is also used by United Nations Peacekeeping forces where it is often painted United Nations blue to match the colors of the United Nations flag. When worn with a helmet cover, the PASGT helmet is also often fitted with a band around it that has two light recharging glow patches (sometimes known as cat eyes) on the rear intended to reduce friendly fire incidents. These bands are also used to hold vegetation or small personal items, as with the M1 helmet before it, during the later decades of its service life. These bands can also have names and/or ABO blood types printed on them to help identify the blood type the wearer in case a blood transfusion is required as a result of blood loss due to wounds received on the battlefield. In the U.S. Army, PASGT helmets often featured a patch with the wearer's rank insignia on it stitched onto the front, and/or a second patch showing the symbol of the wearer's unit on the sides. The U.S. Marines wore the Eagle, Globe, and Anchor branch of service insignia on the front of the helmet as an iron-on transfer, similar to the one worn by Marines on the breast pocket of the BDU. This practice continued with the adoption of the LWH, but fell out of use and was discontinued because the mounting base for night vision devices covered the emblem, and required a hole in the fabric to attach, defacing the symbol. The PASGT helmet was developed by the U.S. Army Soldier Systems Center after the Vietnam War during the mid-to-late the late 1970s. It completely replaced the steel M1 helmet in U.S. military service by the end of the 1980s. It first saw use in combat in 1983 during Operation Urgent Fury in Grenada, and became standard issue for the U.S. military in 1985, and completely replaced the M1 helmet for frontline troops by the end of the decade. Army soldiers stationed in Alaska were some of the last to receive the helmets, some not getting the PASGT until 1988. A helmet mount assembly to attach night vision goggles, such as the NE-6015 or AN/PVS-14 MNVD, the F5001B or AN/PVS-7B. The PASGT helmet was replaced in U.S. military service by the Lightweight Helmet for the U.S. Marine Corps and the Modular Integrated Communications Helmet by the U.S. Army, which was in turn replaced by the Advanced Combat Helmet, which the U.S. Army currently uses. Both the U.S. Marine Corps and the U.S. Army are looking at yet another helmet replacement for their PASGT helmet successors: the Enhanced Combat Helmet (ECH) with distribution to start in 2014. However, the PASGT system is still used by some U.S. allies and still sees some continued limited use in the U.S. military as of 2017, where it serves as one of various vests for sailors assigned to duty on board U.S. Navy vessels. A U.S. Navy sailor in 2016 wearing a PASGT vest. Although it has been discontinued in the rest of the U.S. military, the U.S. Navy was still using the PASGT vest aboard its warships as late as June 2016. A U.S. Navy sailor in April 2017 wearing the PASGT-derived "U.S. Navy Flak Jacket". Although it is derived from the PASGT and is similar in appearance, the "U.S. Navy Flak Jacket" is actually a different model of vest altogether. U.S. Army reservists wearing PASGT vests in August 2018. 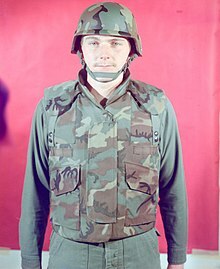 The vest of the Personnel Armor System for Ground Troops was the United States military's standard upper torso body armor from the mid-1980s up until the early 2000s, when it was replaced by the Outer Tactical Vest of the Interceptor body armor system. 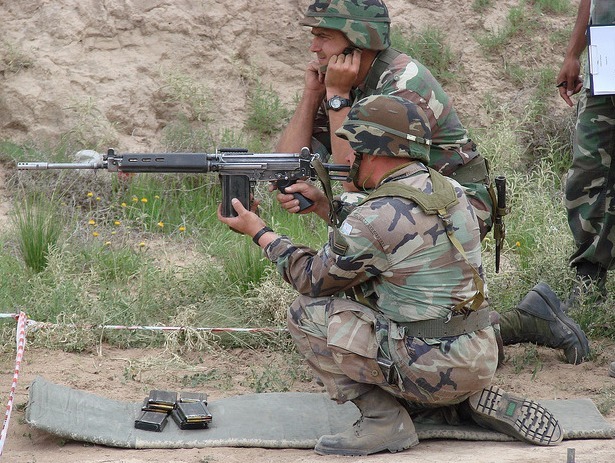 The PASGT vest replaced the M-69 Fragmentation Protective Body Armor nylon vest in use by the Army, and the M-1955 Fragmentation Protective Body Army nylon and Doron Plate vest in use with the Marine Corps. The PASGT vest utilized Kevlar for the first time in the United States military's body armor, unlike the Ballistic nylon that was used in the models of body armor that preceded it. While generally incapable of stopping rifle bullets, the PASGT vest provided better protection against shrapnel and reduced the severity of injuries from small arms fire when compared to the M-69. Despite its ability to stop pistol rounds, including 9×19mm Parabellum FMJ, the vest was only ever designed or intended to stop small fragments without injury to the user. The PASGT vest weighs approximately 9 lb (4,080 g), a small increase over the previous model. Based on testing conducted for the Brass Fetcher Ballistic Testing Company, former ARDEC research engineer John Ervin stated that the PASGT vest is equivalent to NIJ level II or IIA protection: able to stop multiple 124-grain 9x19mm FMJ pistol rounds to its main torso panels (front and back), but susceptible to several closely-spaced rounds or shots to the thin neck and shoulder panels. Another independent test, featured in the magazine GunNews, claimed that the PASGT vest could stop .357 Magnum Federal 125 grain JHP, .357 Magnum S&W 158 grain JSP, 9mm Federal 115 grain FMJ, and 9mm +P+ Corbon 115 grain FMJ at a range of 10 yards, though was penetrated by a second closely-spaced shot of 9mm Federal FMJ after the first. The PASGT vest itself is covered with Woodland pattern nylon fabric (a very limited number were made in olive drab but only Woodland versions were issued to US forces); to increase stealth capabilities on the part of the wearer camouflage covers were worn atop it in various camouflage patterns. Early camouflage covers were in DBDU but later came in the DCU pattern. The prototype versions of the vest from the 1970s were in the ERDL pattern. The PASGT vest was designed in 1975 and was tested by in the late 1970s before being fielded in the early 1980s. In January 2000, the U.S. Navy began using a derivative variant of the PASGT vest known as the "U.S. Navy Flak Jacket Mk 1, Mod 0". This vest was still being used by the U.S. Navy as late as April 2017. The USN Flak Jacket is sage green or brown in color. Although this vest is quite similar in appearance to the PASGT vest, it actually is a different model of vest altogether. 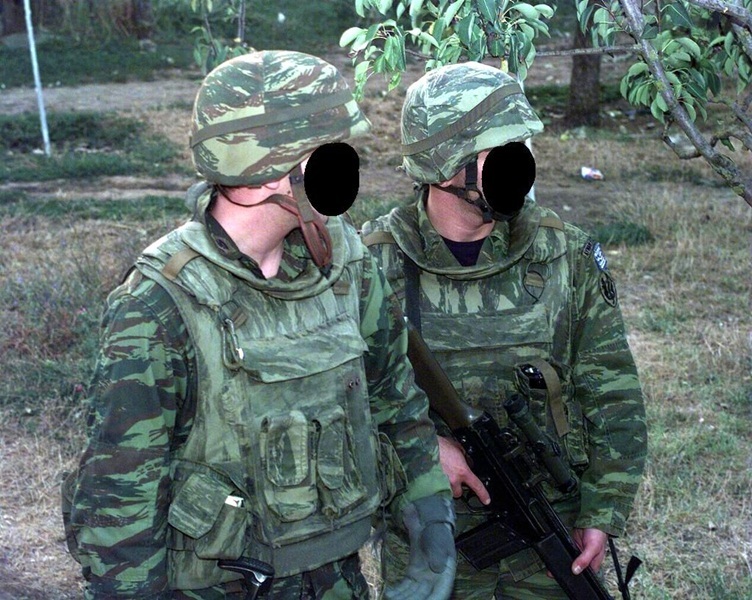 In order to provide protection against high velocity bullets, the PASGT vest was, in 1996, combined with the Interim Small Arms Protective Overvest (ISAPO) pending the adoption of Interceptor body armor. The ISAPO weighed about 16.5 lb (7,480 g) and consisted of a carrier to hold two protective ceramic plate inserts. A PASGT armor system with overvest weighed more than 25.1 lb (11,390 g) and was criticized by many U.S. troops as unacceptably cumbersome in combat. The ballistic fill consists of 13 plies of 14 oz. water repellent treated Aramid (Kevlar 29) fabric. The inner and outer cover, shoulder pads and front closure flap of the vest are water repellent treated 8 oz. ballistic nylon cloth. While it had been phased out as frontline body armor by the start of the Iraq War in 2003, the PASGT vest saw some limited wear and usage by United States military personnel during the early stages of the war, where it was worn behind the frontlines by rear-echelon support personnel and navy sailors such as Seabees. Some U.S. Army soldiers would utilize old PASGT vests as makeshift armor as protection for their vehicles in the absence of purpose-made, designated up-armor kits. The PASGT vest was succeeded in U.S. military service by the Outer Tactical Vest of the Interceptor Body Armor system, which was, in turn, partly replaced by the Modular Tactical Vest, Improved Outer Tactical Vest, and Scalable Plate Carrier. However, the PASGT vest still sees some limited use in the U.S. military as of 2016, where it serves as one of many vests for sailors assigned to duty on board U.S. Navy vessels. Afghanistan: Uses ArmorSource-made PASGT helmets provided through FMS sales. Argentina: Used by Argentine Army. Australia: Known to be made by RBR Armor Systems for the Australian Navy's Clearance Diving Team operators. Variant of the helmet used in service as the M91. Brazil: Used both American and Brazilian-made PASGT helmets. Bolivia: Adopted by the Bolivian Armed Forces in the 1990s. Costa Rica: Used since 1990s by various Costa Rican public security units. Dominican Republic: Used by the Dominican military, replacing all M1s. Ecuador: Ecuadorian-made PASGT helmets in use by the military. El Salvador: Used in El Salvadorian military to replace M1s. Georgia: PASGT helmets made by STC Delta are used by the Georgian military. Greece: Used by Hellenic Army. Haiti: Used by Haitian National Police. Honduras: Used by most Honduran military units. Iraq: Used by Iraqi commandos operating under Counter-Terrorism Service mandate. Israel: Used by the Israeli military, most supplied by the U.S. with some made by Orlite. Mexico: Mexican military uses both American and Mexican-made PASGT helmets. Nicaragua: PASGT helmets have been used since the 1990s by the Nicaraguan military. Paraguay: PASGT helmets replaced M1s in the Paraguayan military. Portugal: Used by Portuguese Army. Philippines: Some known to be in use with the Philippine Marine Corps. Saudi Arabia: Used by Saudi Arabian Army and Saudi Arabian National Guard. Slovenia: Used by the Slovenian Special Police Unit (Specialna Enota Policije). Uruguay: Mostly used by Uruguayan UN peacekeepers. Some are used by the National Police of Uruguay. Taiwan: Taiwanese-made PASGT helmets made for the Taiwanese military. Turkey: PASGT used by Amphibious Marine Brigade and Underwater Offence. United States Army Reserve: Limited numbers still used as of August 2018. United States Navy: PASGT vests were still used by the U.S. Navy aboard its warships as of June 2016. The U.S. Navy also uses a PASGT-derived vest known as the "U.S. Navy Flak Jacket". PASGT helmets are still used by the U.S. Navy aboard its warships as of January 2017. Ukraine: Used by Aidar/Donbas Battalions. Venezuela: Uses PASGT helmets made in China for the Venezuelan military. Vietnam: Uses Vietnamese-made PASGT helmets, as well as imported Israeli ones. Canada: Formerly used by the Canadian Army in the 1990s during peacekeeping activities in the Balkans. Singapore: PASGT helmets formerly used by the Singapore Armed Forces made by International Scientific Pte Ltd. with some refurbished by All Defense Technology Pte Ltd.
United States Army: Replaced by the Interceptor body armor and Modular Integrated Communications Helmet. U.S. Marine Corps: Replaced by the Lightweight Helmet and Interceptor Body Armor. Los Angeles Police Department: PASGT helmets were formerly used by the LAPD's SWAT unit. CABAL II Argentina Argentine PASGT derived helmet. Capacete Combate Ballistico Brazil Brazilian PASGT derived helmet. GOLFO Chile Chilean PASGT-derived helmet. The helmet is locally made by Baselli Hermanos S.A of kevlar and was introduced in 2000. It is capable of stopping a 9×19mm round at 310m. Gefechtshelm Schuberth B826 helmet Germany German military helmet, used primarily by the German Bundeswehr, Swiss Armed Forces, Dutch Army, and the Estonian Defence Forces. SPECTRA helmet France French military helmet, used primarily by the Danish Army, French Army and the Canadian military. JK 96a light Light Steel Helmet China Chinese military light steel helmet. PASGT-derivative replica helmet, made of light steel and not Kevlar. Used primarily by the People's Liberation Army of the People's Republic of China. JK 96b Light Steel Helmet China Chinese military light steel helmet. PASGT-derivative replica helmet, made of light steel and not Kevlar. Used primarily by the People's Liberation Army of the People's Republic of China. NDH 2001 helmet China Chinese helmet, produced by the China North Industries Corporation. Norinco produces two types of these PASGT-derivative replica helmets, designed towards civilian police usage. NDH 2006 helmet China Chinese helmet, produced by the China North Industries Corporation. Norinco produces two types of these PASGT-derivative replica helmets, designed towards civilian police usage. OE Tech Tactical helmet China Replica helmet only. M97 Helmet Serbia Serbian PASGT derived helmet. C-1 Kevlar helmet Singapore Used primarily by the Singaporean Armed Forces. Type 88 helmet Japan Japanese military helmet, used by the Japanese Self-Defense Forces and the Japanese Coast Guard. M87 Kevlar helmet South Africa South African helmet issued to the SADF. Made by South African Pith Helmet Industries. Kevlar VestGuard helmet United Kingdom The British VestGuard helmet comes in two different variants, the M88 version, and the Kevlar version. Also made by LBA International Ltd.
M88 VestGuard helmet United Kingdom The British VestGuard helmet comes in two different variants, the M88 version, and the Kevlar version. Also made by LBA International Ltd.
Advanced Combat Helmet United States Used primarily by the United States Army and United States Air Force, although it sees widespread usage throughout the U.S. military and is widely used among civilian law enforcement throughout the United States. The ACH helmet is based upon the design of the Modular Integrated Communications Helmet, offering increased ballistic protection over the MICH helmet on which it is based. The ACH helmet has replaced the PASGT helmet in United States Army usage, and is the successor to the MICH helmet. Lightweight Helmet United States Used primarily by the United States Marine Corps and the United States Navy. Abbreviated to LWH, the Lightweight Helmet is heavily based upon the PASGT helmet design, being nearly identical in appearance, however it offers increased ballistic protection and wearer comfort over the preceding PASGT helmet. The Lightweight Helmet has replaced the PASGT helmet in United States Marine Corps and United States Navy service. Modular Integrated Communications Helmet United States Used primarily by the United States Army and United States Air Force, although it sees widespread usage throughout the U.S. military and is widely used among civilian law enforcement throughout the United States. The Modular Integrated Communications Helmet is the predecessor to the Advanced Combat Helmet, which is an improved design, based upon the design of the MICH helmet. 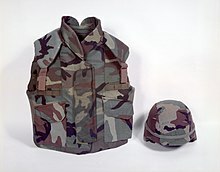 Interceptor body armor, the body armor that succeeded the PASGT vest in U.S. military service. Borit-M 6B7, the new Kevlar helmets used by the Russian Ground Forces with similar styling as PASGT. ^ "The "Fritz" Helmet - Soldier Systems Daily". soldiersystems.net. ^ "U.S. Military Body Armor PASGT". ^ Veterans, Hard Head. "Ballistic Military Helmets and Which One is Right for You!". Hard Head Veterans. ^ Pike, John. "Personnel Armor System for Ground Troops (PASGT) Vest". www.globalsecurity.org. ^ a b c d "Kevlar PASGT Helmet". ^ a b Brass Fetcher (10 December 2011). "PASGT Vest Ballistic Resistance and NIJ Threat Level" – via YouTube. ^ Ervin, John. Brass Fetcher Ballistic Testing: Profile. Retrieved March 3, 2019. ^ Boch, John. "PASGT Torture Test." GunNews Magazine. Mayview, Ilinois. September 2003 Issue. ^ "Green PASGT flak jacket - NOT camouflaged ? - BODY ARMOR". U.S. Militaria Forum. Retrieved September 24, 2017. ^ a b "Kevlar helmet + body armor, front viewa". 1975. Retrieved September 22, 2017. ^ "CEMEL, body armor, vest & helmet, infantry, new - field test - sitting w/bazooka". 1975. Retrieved September 22, 2017. ^ "Cemel, kevlar helmet with camouflage cover". ^ a b c "Album Archive - US Navy Flak Vest". get.google.com. ^ a b Morris, Tyrell K. (April 12, 2017). "170412-N-NB178-035". United States Navy. United States Department of the Navy. Retrieved September 21, 2017. Bristol Rollins, right, and Cryptologic Technician (Collection) Seaman Jonathan Christian man a .50-caliber machine gun aboard the guided-missile destroyer USS Truxtun (DDG 103). ^ "Wayback Machine". web.archive.org. 14 March 2018. ^ "PASGT Kevlar helmet : Sub Lieutenant J Flood, RAN Clearance Diving Team 3". www.awm.gov.au. ^ "Composite Helmet, Ballistic helmets, Military helmets AUSTRALIA, Australian helmet, Kevlar helmet". www.gostak.co.uk. ^ "Republic of Georgia Introduces Body Armor Manufacturing Capability - The Firearm Blog". 2 August 2017. ^ "Wayback Machine" (PDF). web.archive.org. 30 May 2017. ^ "Composite Helmet, Ballistic helmets, Military helmets ISRAEL, ISRAELI helmet, Kevlar helmet". www.gostak.co.uk. ^ "isayeret.com - The Israeli Special Forces Database". web.archive.org. 13 September 2016. ^ "Phil. Marines PASGT helmet". www.oocities.org. ^ "Specijalne-jedinice.com - Special Police Unit of the Republic of Slovenia". specijalne-jedinice.com. ^ "Composite Helmet, Ballistic helmets, Military helmets URUGUAY URUGAUYAN helmet, Kevlar helmet". www.gostak.co.uk. ^ "Wayback Machine". web.archive.org. 14 December 2018. ^ "USS STOUT (DDG 55) TRAINING". ^ "CANADIAN FORCES HELMETS". www.mpmuseum.org. ^ a b "Composite Helmet, Ballistic helmets, Military helmets SINGAPORE, SINGAPOREAN helmet, Kevlar helmet". www.gostak.co.uk. ^ Pike, John. "Personnel Armor System for Ground Troops Helmet". www.globalsecurity.org. Wikimedia Commons has media related to Personnel Armor System for Ground Troops.